After having presented a paper of mine at a conference last summer, I received an email from someone claiming to be part of an editorial team of a journal, to whom my paper was recommended. I sent my work to them, and received an unconditional acceptance after four weeks. But there have been some things that made me doubtful on whether it is actually a good idea to go on and publish there. I received no comments from reviewers. 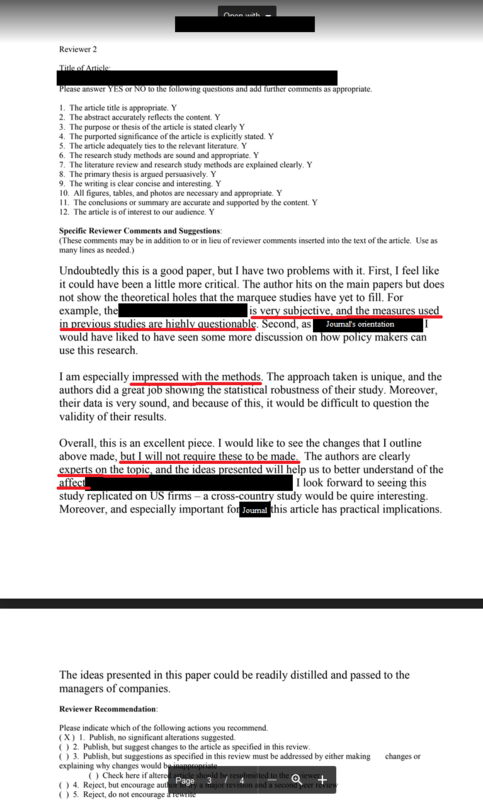 The journal claims on the website that it is "peer-reviewed" (says nothing on the blindness). When I inquired about comments, the assistant to the editor told me that the editor's comments could be forwarded to me, but that that would take some time. I am currently waiting for this (for about three weeks). The contact I have with them, exclusively with the editor's assistant, has been interesting. I receive emails at times when people in the US (it is an American journal) are unlikely to work. The person has an Indian-sounding name, and the hours of activity are more likely to be Indian working hours than American. I could not find anything on the assistant to the editor online. She has referred to me multiple times as "Dr.", even though I am not yet, never used that prefix, and wrote to her after the first time that that is the wrong title. In general, the mails are unresponsive, and only answer one question out of three I asked them, etc. On the journal website, they cite their h-index for the year 2010, and compare it to those of other journals in 2010. The journal does not appear in the ranking at https://www.scimagojr.com/journalsearch.php?q=JOURNAL+NAME. In turn, I do not know how reputable that website is, but it looks quite complete. I can not find a list of articles that appeared in this journal on their website. I would like such a list to compare my article to others, and to see who the other authors are, how often their articles were subsequently cited, etc. As the journal's name is consisting of quite generic words, it is difficult to find articles from it on Google scholar - or they are not even indexed on Google scholar, although they claim to be on their website. I also sent emails to academics that are listed on the Journals website as editors. They were not listed with institutional affiliations, but I googled their names, found academics with the same name and active in overall the same academic field, and wrote them emails, asking about their affiliation with the journal and whether it is legit. I received no replies. In case of acceptance, I have to pay 320$ to publish, this includes the subscription to the journal for one year. I am now wondering whether, given all of the above, it is a good journal to publish in, or whether there even is such a thing as a scam in this area of academia that I need to be aware of. Other journals also require a publication fee or even a submission fee, but in their cases, it is more clear to the authors what they gain in return. If it is not a financial scam, could it be a sort of academic scam - an attempt to steal results? But what good are stolen results with no data? Should I mention the publisher and the journal name in this question? Definitely a scam. I get these invitations every couple of months, from an organisation whose acronym quite appropriately rhymes with "diarrhea". I received an email from someone claiming to be part of an editorial team of a journal, to whom my paper was recommended. If it's legit, I would expect them to mention who recommended your work. But unless you've produced something world-shattering, it's very unlikely that a legitimate journal would be cold-calling you to invite you to submit. Yeah, the quick turn-around plus lack of comments is a pretty good sign that their "peer review" is non-existent. I've never known a peer reviewer who couldn't find something to say, even if it was just "you should cite these eight papers by the very eminent Prof. P.R. Revua". An Indian-sounding name doesn't mean anything on its own; there are plenty of eminent academics of Indian origin all over the world. But the rest of this is definitely suspicious. The ones who spam me also have a poor grasp of English grammar; while that's not unusual for academics (even the native English speakers, cough cough), it's very suspicious for a publisher. The fact that you can't find information about other articles they've published is also a strong sign of a scam. It's very unlikely that these people are trying to steal your results. More likely, they're just trying to get a $320 fee out of you for significantly less than $320 worth of work on their part. They may publish your work but it's not going to be worth anything to you, and may even count against you if you list this journal on your CV. It's also quite possible that if you do pay the $320, they'll hit you up for more. Your advisor should be able to give you some advice on more reputable journals in your field. In the meantime, keep your money, and be on the lookout for more scam attempts - once a scammer gets a response from somebody, they're very likely to target that person for future scams, or sell them on to another scammer. I don't think informal tone or minor spelling/grammar issues from a reviewer are suspicious in themselves. 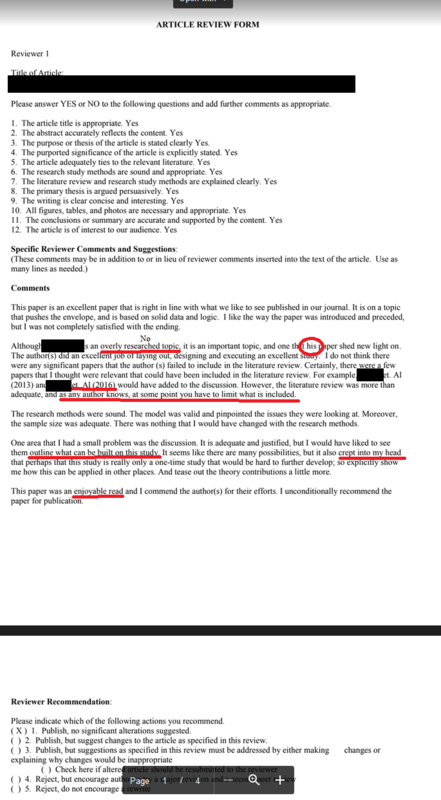 Reviews don't have to be as formal as a published article, and many reviewers aren't perfect English speakers. What I do notice is that the writing style is quite similar between these two reviews. I can't be sure from the few paragraphs provided, but I wouldn't be terribly surprised if they were both written by the same person. One error that did raise my eyebrow was Reviewer 1's repeated "et. Al" which should be "et al., short for Latin "et alia". This is such a common part of academic English that I'm surprised any serious academic wouldn't know it. More suspicious IMHO is the point that @NajibIdrissi noted: these reviews are very generic. Without any previous experience in your field, I daresay I could write something like this after five minutes of skimming your paper and five more of googling for references that match your keywords, and I could recycle 90% of it for the next review I needed to produce. There are always more papers that could be included in the lit review, there's always more room to discuss further applications, and every author wants to be told that their model is valid and their methods are sound. The information you provide points toward a predatory journal, here to take your money with little benefits for you. Do not pay the publishing fees. On their website, can you see an editorial board with clear affiliations? If yes, try to verify if the editors listed are really members of these organism. Many universities have a list of faculty member. Look at the published articles of the journal. Can you find them in your usual search engine or even in the search engine the journal boast they are in? As a general check, how does the website looks? Is is boasting an impact factor on the homepage? Does it have detailed information about the peer review process? If the journal is Open Access, you could verify if it is listed in DOAJ. I am a DOAJ editor and we do verify the legitimacy of journals. If you do not like DOAJ (I know some people here don't), there exist list of predatory journals you could verify. As the suggestions have been very clear, I have withdrawn my submission, while not being encouraged to name the journal or publisher here. Instead, you said I should focus on describing their practices to keep the question general. As such, what now happened is that, after having waited a few weeks for revierw's comments, and hearing nothing, I wrote the assistant to the editor that I would withdraw my submission. Immediately, they sent the following document. I marked those phrases that put me off in particular, because they were sloppy, too general, or should have been substantiated more. These reviews seem like a hastily compiled document by someone with no academic backgroup, who tries to appear academic. In the first review, the word "his" might just be a typo from "this", but it just adds further questions on the blindness of the review process. The second paper they refer to, I could not find. The first, I could find, but at first glance it does not look too relevant. However, I will look at it in more detail. The argument that "as any author knows, at some point you have to limit what is included" seems, however, closer to student's wishful thinking than to appropriate rigor. The second reviewer states that the previously employed methods are subjective and highly questionable, but that they are impressed with my methods. However, my methods are just combinations and extensions of previous methods. I can also not understand why they would like changes to be made, but not require them to be made. Not the answer you're looking for? Browse other questions tagged journals publishers disreputable-publishers or ask your own question. Why pay a fee to have your article (in a subscription-based journal) made open access when you can just put the preprint on arXiv? Is there a website that lists the journals that are actually scams? How should I withdraw a paper from a predatory journal?